Art deco plan of San Francisco. Map of the City & County of San Francisco. An appealing 1932 art deco style pocket map of San Francisco, California, by H. A. Candrian. 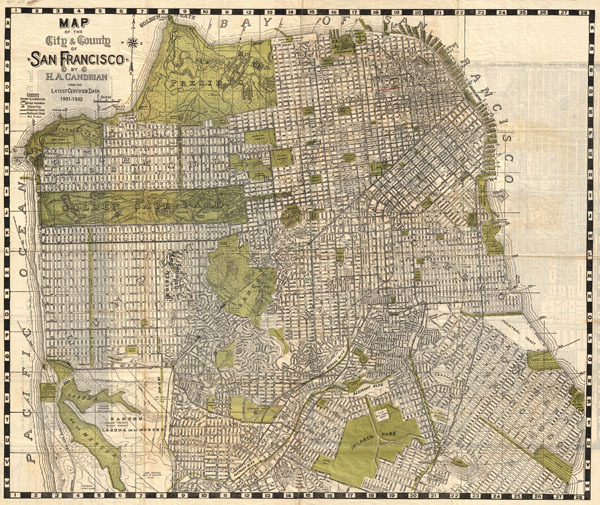 Issued just prior to World War II this map covers the city from Presidio Park as far south as McLaren Park and the Laguna de la Merced. The map names all major and minor streets as well as trolley lines, lakes, golf courses, piers, municipal buildings, colleges, and military installations. Parks and public areas are highlighted in green. Surrounded by an art deco segmented border. Title and legend in the upper right quadrant. Hermon Anton Candrian (fl. c. 1881 – 1940), commonly publishing as H. A. Candrian, was an American map publisher active in San Francisco in the first half of the 20th Century. Candrian’s works focus heavily and tourist and railway guides to the city of San Francisco and the general Bay area. Very good condition. Printed on very thin paper with minor archival repair on verso. Some wear on original fold lines. Additional regional maps and photos on verso. Some manuscript annotations on verso.